« Look How Far We’ve Come! The “geoboard” is something that is found in most elementary school classrooms and is generally used for the purpose of building math skills like making geometric shapes and finding area and perimeter. This is something that I will definitely work on with Andrew someday but when I looked at this tool I realized that it would be a fun way to help him build his fine motor skills and fine motor planning. 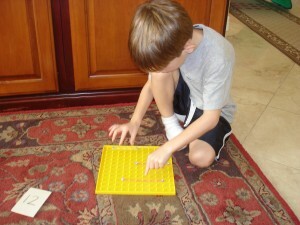 The geoboard is made of a grid of pegs and comes with rubber bands. By fitting the rubber bands around the pegs, you can create different shapes. I was not focused on creating shapes though. I wanted him to work on the basic skill of putting the rubber band around one peg, stretching it and putting it around another peg. Sounds easy enough but it was quite a challenge and I was glad I started basic. I placed small stickers on the pegs I wanted him to put the rubber band around. Each pair of stickers matched so he’d know which ones to connect. Some were closer together and others farther apart so he’d have to stretch the rubber band a bit more, working on doing it so the rubber band didn’t fling off! 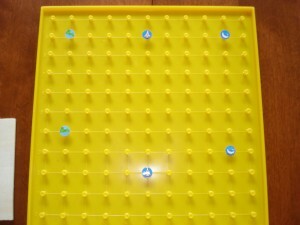 A "Geoboard." I placed small matching stickers so he would know which pegs to put the rubber band around. I modeled what we were going to do before giving him the rubber band. Working with rubber bands requires more attention from the adult so it doesn’t hurt them or someone else. Like I said, I knew that it was going to be challenging for him so I did hand over hand while also holding one end of the rubber band on the peg so it wouldn’t come off. His job was to stretch the rubber band and fit it around the peg with the matching sticker. It was great for him to feel the tension and push himself to pull it farther. He wanted me to do it for him but I simply helped his hand stretch it so it would reach around the peg. Once he got done with the three rubber bands, he was very proud of himself. We continued to work on this in a basic way until he got the hang of it and knew what he needed his fingers to do. 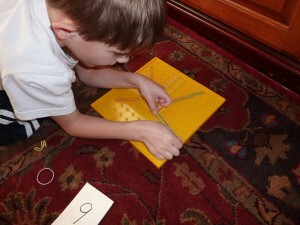 Andrew making a geoboard spider.